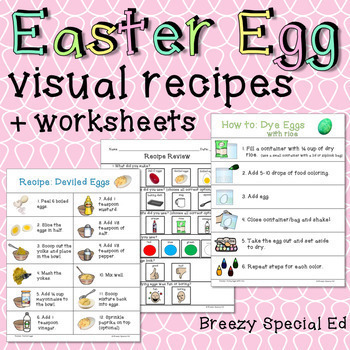 These visual recipes and worksheets make it fun to both dye Easter eggs and also incorporate several egg recipes around Easter time! 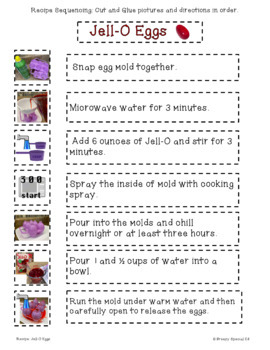 Extra: page with egg dying options such as adding rubber bands, stickers, tape or coloring with crayons before dying. 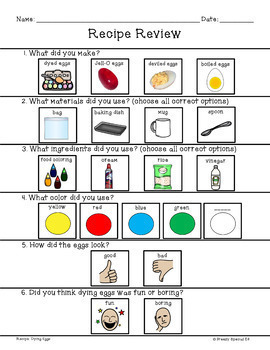 Visual Recipe: This one page visual recipe is great for visual learners! Sequencing Worksheets: 1 worksheets = 3 levels. 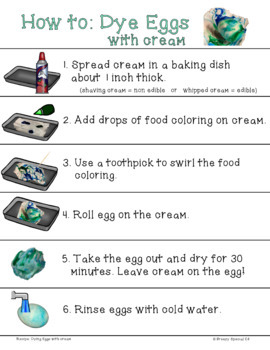 3: Draw and write the recipe steps. Download the preview to see more! ✯Click the green star that says "Follow Me" near the top of any page within my store and you will officially be a follower! ✎ Follow me on facebook for lots of great ideas and sales!